Successfully Added Head Visor Magnifying Glasses to your Shopping Cart. Finally, a truly valuable tech gadget that the whole family can enjoy. Offered to you at a low wholesale cost and with factory direct low china wholesale price and we'll even dropship it to your customer. 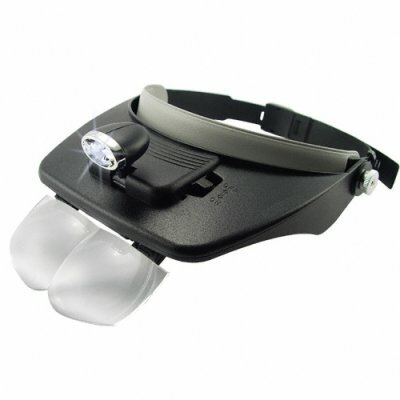 Magnifying glasses mounted on head visor - great for craftsmen or hobbyists. Provided with 4 different lens sets for 1.2-3.5 times magnification. I was very impressed with the speed of delivery for this item and this company. It arrived very well packaged and quicker than other orders Ive placed just 50 miles away! The product itself does what I wanted it to do, and its easy to adjust and Ive managed to get a good fit around my head. The pale blue light (daylight effect?) is not that strong so dont expect a beam of perfect light, I might also prefer a whiter light, but it is perfectly adequate so far, All in all, a useful and practical product. Well what can I say.. I used to use reading glasses while doing electronics PCB repairs and It was always a hassle doing the close up work until now.